A little while back I wrote about my new project using felt butterflies. Well my project is now finished, and so I present to you my colourful denim bunting with felt butterflies! I made ten butterflies out of felt, using lots of different colours. 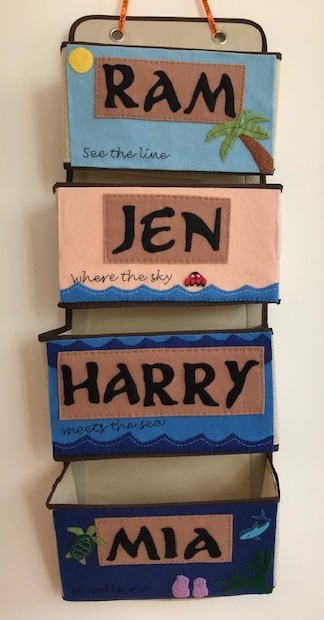 They all use the same pattern, and were very quick to stitch together. I had lots of fun choosing different colour combinations, sometimes going for colours that were similar and somethings going with something that had a little more in the way of a contrast. I used a paper pattern that I drew up quickly. For the denim flags I cut up an old pair of jeans which had developed holes in the knees (thank you crawling baby). I cut the flags so that the grain ran the same way on all of them, and I washed the pieces so that the edges frayed nicely. Then I ironed them (don't laugh, Mum) before sewing on the felt patches. I purchased some stiff red ribbon to sew the flags to at the top. When it came to sewing the flags to the bunting I had a bit of a dilemma, because I wasn't sure whether or not to leave gaps in between the flags. I've seen it done both ways, and both ways look good. In the end I decided upon a 7 cm gap between flags as I thought that spread the flags out nicely. They are hanging up in the summerhouse, which I'm intending to decorate for the summer with a butterfly theme. Even though the weather is only just starting to warm up, we've already spent a lot of time out there, so I think that we'll still get to enjoy them a lot even though they're not in the house. 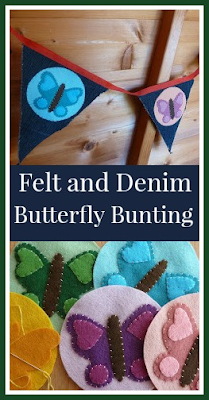 Do see this fab tutorial at The Girl Creative for making denim bunting. I'd already decided to use red ribbon on mine, but this tutorial inspired me to wash the denim once the flags were cut to make the edges fray so beautifully. I've since made some flowery fabric bunting to decorate the outside of the summerhouse, and it is starting to look very pretty! I will be linking this post to the Jeanius Challenge at Me and My Shadow, pop by to see lots of other lovely ideas for recycling denim, including some more gorgeous bunting made from denim. I simply LOVE those felt butterflies, what a beautiful idea. I want to hang out in your summer house! Thank you! You have some lovely denim things in your linky, I still have half a pair of jeans left so some good inspiration for me to use up the rest! Gorgeous idea. Denim and felt goes so well together! Thanks! I wasn't sure how well it would look but I think that it works really well, the denim is good for the bunting as it's a nice stiff fabric. I love the bunting! I wonder if it would work in a boys room? Maybe with cars instead of butterflies. Thank you! You know, I'd thought about making a boy's version of this and cars had crossed my mind! You could use the same template for each car but with different coloured wheels, windows and so on. Hmmm, am thinking now! Oh my! This is so pretty. I must do it for my daughter's room.